I'm taking a breather here in Portland with my brother and his wife. I've had the luxury of spending most of the last day knitting, drinking coffee (Stumptown, we're not worthy), and playing with the dog. I can't complain. I thought I'd do a quick post from the road: Progress resumes on the Swish Top-Down Raglan. Its 'Shedir' from Knitty's Breast Cancer Awareness Mini-Issue. Knit with Rowan Calmer in 'Coffee Bean' on size US 3 16" circulars. I've always wanted to make another for myself, but I'm just too cheap for non-sale Rowan. More to come from the road. A proper California update, and meeting with the wonder herself! Happy Halloween! Beautiful Shedir, I love that pattern. I am totally with you on the Rowan front though. I only seem to buy it for others. The raglan is coming along nicely, can't wait to see it finished! Gorgeous shedir! Did you buy any sundara yarn? Gorgeous Shedir, I must try that some day. wow, the swish superwash is looking better each time i see it! now i have to get some to make some glittens for a friend of mine. and that shedir. i MUST make one! i'm now completely smitten. Gorgeous hat! I think I might have to make one for myself! Enjoy Portland and have a Happy Halloween. i do love that hat! i would definitely spring for a ball of calmer, even non-sale. so, does it really only take one ball? and how's the fit/finished size? Beautiful shedir. And yes, the coffee. I'm in the Midwest, from the Northwest--I think you can feel my pain. You have some of the most beautiful knitting blog photos I've seen--doubtless due partly to your own eye. But the camera too--what camera are you using? Oh damn - I love that hat and now I'm going to have to break my own no-Christmas knitting rule and knit that for my husband. But, as always, you have the best projects. I can't wait to hear about the CA girls and the wonder herself. Fantastic hat. It's really beautiful and looks like fun. I went back and printed off "Shedir" ...your version, in that warm coffee bean color is superb! First off, all of your photos are artsy. Secondly, I have recently come into some Calmer, and would be delighted to share the wealth, should you be so desirous. After all, I still owe you from that marvelous letter you sent the boys. That hat is exquisite. I've never seen that pattern before and I just stared at it forever. You have lucky family indeed! Love the hat, it's such a great pattern. And the top down raglan is looking good too! Enjoy the rest of your trip! ack, i started shedir once. not pretty. i will try again at one point - this time without alcohol. your trip sounds wonderful! lucky you who gets meet everyone! give sundara a hug from me! a five years old Australien shephard. I love him!!! Thanks for the pattern!! shedir and boobie scarf are very pretty. Best wishes and happy knitting!! beautiful, and i LOVE the dog pics too! what lens are you using? i love how you manipulate the depth of field... also i've been meaning to ask, how is your forbes forest scarf? I would love to make one and am curious about the yarn... has it pilled or is it keeping up great apperances! thanks for being such a great knitting/photography inspiration! I love the Shedir. It's been on my list for such a long time. Perhaps it's time to dig through the stash and see what yarn I've got for it. That hat is awesome........ I am now putting that on my TO DO list. Wow, what a beautiful dog! Love that shedir. It's wonderful! Hmm, how did I miss that hat pattern? Yours came out just lovely. shedir has been on my to knit list for a while - seems that the list grows faster than I can knit! Ah, Stumptown. I can't wait for my late December visit! As always, I love your color choices. Safe travels! That's a great hat, and it's really nice in that color, too. Shedir is such a beautifully stunning knit. And it's particularly pleasing to see it on a man. I do believe that's the one I need to make for my brother-in-law. Thanks for the inspiration! Enjoy your trip! :) Keep us posted about the baby sweater - I LUV it! Fabulous hat - love the way the cables stand out in relief, like a modern Celtic pattern. Great 'artsy' photo - wish I looked that good in the morning. Very nice hat, the celtic pattern looks great. You're knitting is truly awesome! Wow, what a beautiful dog! And sweater. And hat. Every time I read your blog, I want to knit a sweater for the DH. But then I always get distracted. Can't wait to read about the knitting travels. I'm going to Portland in 3 weekends and am really looking forward to it. OMG! Thank you for introducing me to "Shedir"! I never knew about that special issue of Knitty and now Shedir definitely will be knitted soon...apart from that the cable on that is going to be used for a project I have in mind last night! Absolutely PERFECT!!! I like the choice of the brown and, is it a hot pink? Very nice combination. The hat is great!! That needs to go on the to do list for sure!!! How could you not want to play with that dog all day.....your lucky to have got any knitting done!!! Great lookig sweater...it is going to look wonderful when done!!! thanks to your beautiful shedir, i have tacked yet another item onto the must knit by christmas list. lovely colors on the raglan, can't wait to see the final product. The sweater is looking spectacular, I really love the color combination! And the Shedir! Gorgeous! What more needs to be said? That hat is just damn beautiful! The engineering of the traveling stitches at the top is worth it. And I'm going to a yarn store tonight. Thanks for hipping me to my next project. I love your blog, so you're on my sidebar so I don't miss out anymore! Stumptown rocks. It's all about a sustainable cuppa. Booyah. Or, Brew-yah! Looking forward to reading of and seeing the rest of your west side story! 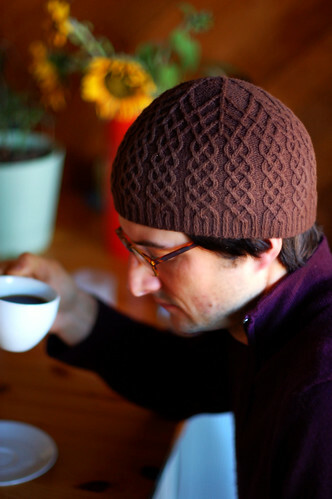 Oh my goodness, I'd never even considered the hat until I saw it here in brown. How many skeins did you use? Did you change the pattern at all to fit a man-sized head? I think that my husband might love it if I knit this for Christmas. I'm looking at a real-life Swish color card and still can't figure this out. Your sweater is in truffle and... wisteria? Is that it? those raglan colors are yummy! and the hat is of sure perfection! You know, I have been wanting knit a hat for DH but never even considered Shedir until I saw your lovely chocolately version. Must begin one right away! Do realize how many people you have inspired to knit a hybrid sweater and whom you've turned on to EZ knitting!? I have counted numerous times people refer to you and your knitting on the Zimmermania blog. How awesome....I have bought Knitting w/o Tears and the Almanac too. I am better than halfway through my hybrid and can't wait to start my next sweater. Thank you for sharing and being an inspiration to so many. wow- those are great colors together!!!!! I just bought some burgundy KP Swish but I haven't yet decided what to do with it. good combo. I might order some brown now - what a It's good to see how well it knits up! As always, your photographs sell the project! I never would have thought to translate Shedir into a masculine version... yours looks fantastic! Yay! I just finished Shedir - totally inspired by the awesome photos you have of the one for your brother. Thanks so much for showing this great hat on a guy (even though mine is for my daughter). It's perfectly versatile for men or women!